The Philadelphia Flyers Fan Club is saddened by the passing of longtime member Evelyn Gross. to Ev’s family and friends. The PFFC is looking for new activities and wants to hear from you. Please download the 2018 Activity Survey here. Visit phansofphilly.com or contact Lou Milano (609.922.2234 or lmstut@comcast.net) for more information. As the official booster club of the Philadelphia Flyers, the PFFC is a member of the NHL Booster Club. You can learn more about the NHLBC, as well as fellow member clubs here. November Meeting Highlight: Fan Club members had the opportunity to catch up with former Flyers great Danny Briere. 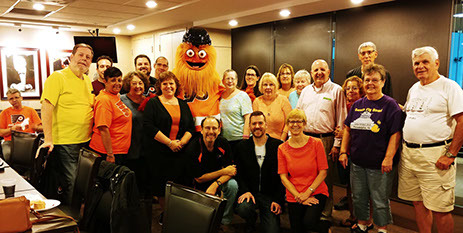 The Philadelphia Flyers Fan Club (PFFC) is the official booster club of the Philadelphia Flyers hockey team. The club holds many events during the hockey season and the off season. Activities include hockey trips to Flyers road games, an annual holiday party, Beef and Bowl, occasional hockey debates, and just plain fun! Many friendships have been formed! We also have monthly meetings during the regular season in which we host a member of Flyers organization or media. You can find us at every home game on the Main Concourse near section 109. We are there an hour before the game and between periods. Stop by and learn more about our club. Copyright 2016 by [PFFC]. All Flyers logos and insignias were used with explicit consent from the Philadelphia Flyers Organization. Any other Flyers Fan Club Site is not affiliated with the PFFC or the Flyers Organization. Any Flyers appearances or merchandise must be acquired through the Flyers Organization. Any selling, trading, bartering or buying of merchandise, tickets or other articles are strictly prohibited. PFFC is not liable for any items trades, sold, bought and other wise traded or bartered with other sources or people. Any persons caught trying to solicit items will be prosecuted to the fullest extent.